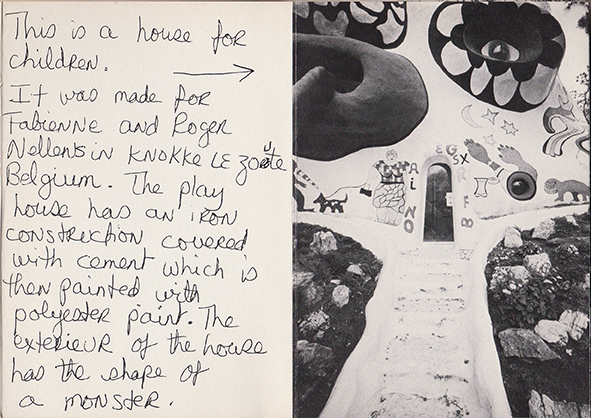 During the summer of 1968, Belgian collectors Roger and Fabienne Nellens saw Niki de Saint Phalle’s Nana Dream House. It was a Nana that took on the form of an architectural structure guests could peer and walk into. The couple was inspired to commission the artist to create a play house for their son Xavier, in the garden of their home in Knokke-le-Zoute. 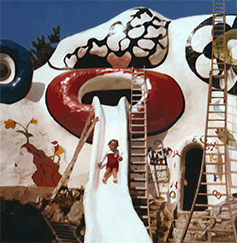 Niki de Saint Phalle had created two larger outdoor architectural projects by this time. In the South of France she had created a collection of three structures, called Le rêve de l’oiseau. One contained the kitchen, one was the living space, and the last had the bathroom. Then, in 1972, Saint Phalle built Golem, a playground commissioned for children in the City of Jerusalem. The black and white monster features a staircase that rounds up into the Golem. This leads children to the mouth of the monster, where they can slide down one of three bright red tongues, one for each religion. “I have always had a dream of doing architectural things. In 1973, with the assistance of Jean Tinguely, Niki built Dragon for young Xavier. Originally, the Nellens had thought the structure would be in the middle of the garden. However, Niki suggested putting it along the hillside. Concrete Spraying – Dragon Knokke from Niki Charitable Art Foundation on Vimeo. After laying the foundation, the welding of the iron skeletal structure started. Jean Tinguely and Rico Weber could be seen climbing all over the structure as they welded, sometimes long into the night. Once the steel frame was in place, it was then covered in cement. At first the men laid the cement in by hand, then used a method of spraying the concrete onto frame. This method was first used on the Golem and proved effective and was used again later for the monumental sculptures at the Tarot Garden. The concrete was then smoothed by hand with brushes before it was fully set. As summer approached, Dragon was ready to be painted. 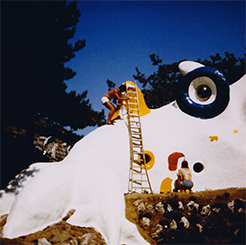 Niki de Saint Phalle walked around the bright white creature, outlining the imagery that would cover the Dragon. Then, everyone was put to work on painting, including Roger Nellens. A panther, a spider, snakes, and many other images took shape in bold bright colors across the structure. A Formula 1 race car was also painted on the monster, and the famous driver Jacky Ickx contributed to painting it. Like Golem, Dragon has a tongue slide for Xavier and other children to slide down. The Dragon’s mouth and tongue were painted bright red. The tail that ran through the garden’s hillside was also tattooed with images. Portholes in the roof and the side of the structure illuminated the interior space. Custom windows had to be designed to fit into the monster’s bulbous eyes. A kitchen, bath, toilet, and heating system were also added, while sleeping accommodations were on the second floor. In the end, the structure was 21 feet high and 110 feet long, colorfully painted to stand out against the landscape. Journalists at the time estimated it had cost between $30,000 and $40,000. Roger had never asked for a building permit for the structure, anticipating that his request would be denied. There were daily visits from the police, warning him against building such a large structure without a permit. However, once the Dragon was completed, even the police couldn’t resist asking for a photo in front of it! 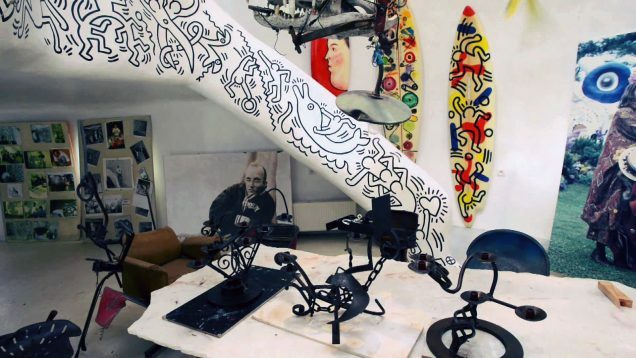 In later years, artist Keith Haring stayed in the Dragon while working on a mural in the Knokke Casino. The Dragon was one of Keith Haring’s most favorite places to work. He was so inspired by the space and asked Saint Phalle if he could paint a portion of the interior. She was thrilled to accept and now there is a fresco lining the staircase wall. Jean Tinguely also contributed not only to the structure of the Dragon, but to the interior as well with a set of chairs and a lamp. Since the Dragon’s creation, it has been classified as a Monument Historique of Belgium. People from all over the world have gone knocking on Roger’s door to see it. Despite being on private property, Roger has graciously opened the door of the Dragon for visitors to get a glimpse. He always shares his vivid and joyful memories of Niki de Saint Phalle, Jean Tinguely, and their friends that were part of the creation of the Dragon.